Made with 100% New Zealand grown potatoes. 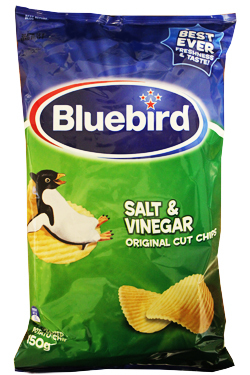 Original cut chips with salt and vinegar seasoning. Potatoes, Sunflower Oil, Food Acids (Sodium Diacetate, Citric Acid), Salt, Corn Starch, Mineral Salt (Potassium Chloride), Maltodextrin, Flavour Enhancer (E621), Sugar.